In this article, we report a case of a patient with early RA who failed and experienced adverse reactions to first-line DMARD treatment. The patient later achieved disease remission after switching to a biologic monotherapy. A 36-year-old banker with good past health presented to our rheumatology clinic with a 6-month history of bilateral wrist pain. He initially sought medical attention in the private sector for a 2-month history of bilateral symmetrical wrist pain and swelling. Blood tests done in the private sector showed high titres of rheumatoid factor (RF) and anti-cyclic citrullinated peptide antibody (anti-CCP), an increased erythrocyte sedimentation rate (ESR) of 70 mm/hr, and an increased C- reactive protein (CRP) level of 30 mg/L. He was diagnosed with RA based on the 2010 American College of Rheumatology (ACR)/European League Against Rheumatism (EULAR) criteria,4,5 and started on a short course of oral prednisolone 10 mg daily plus oral methotrexate (MTX) with an escalating dose of up to 25 mg once weekly in the private sector. 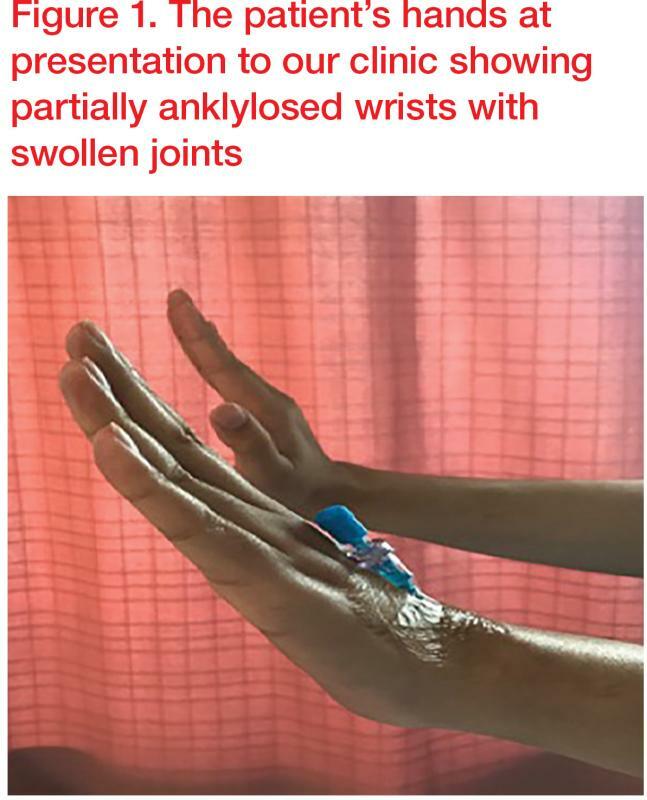 Despite good drug compliance, the patient’s wrists remained painful and he therefore came to our clinic for further management. Upon our first assessment, his wrists were found to be partially ankylosed with moderate joint swelling. (Figure 1) His liver function tests showed raised alanine aminotransferase (130 IU/L) as well as high ESR and CRP levels. Results of hepatitis B and C serology were negative. Ultrasound of the liver was also unremarkable, which pointed to suspected MTX-related deranged liver function. MTX was stopped and results of subsequent liver function tests gradually normalized. Musculoskeletal ultrasound of the wrists showed increased vascularity in power doppler signals suggestive of active joint inflammation. As the patient presented with high titres of anti-CCP, with raised inflammatory markers in the initial presentation, his disease might progress more rapidly with a risk of early joint erosion. He was thus recommended to consider escalated treatment such as biological DMARDs. He was started on once-monthly interleukin-6 (IL-6) inhibitor monotherapy administered as an intravenous infusion. After 3 months of biological DMARD therapy, his wrist swelling showed much improvement with normalization of ESR and CRP. Due to cost and rapid clinical improvement, the patient preferred to lengthen the biologic treatment interval to once every 2 months. He has remained pain-free and has attained RA disease remission. He can now enjoy his favourite pastime of playing basketball and carry on with his usual work. 2) Treatment should be aimed at reaching a target of sustained remission or low disease activity in every patient. 3) Monitoring should be frequent (every 1–3 months) in patients with active disease. 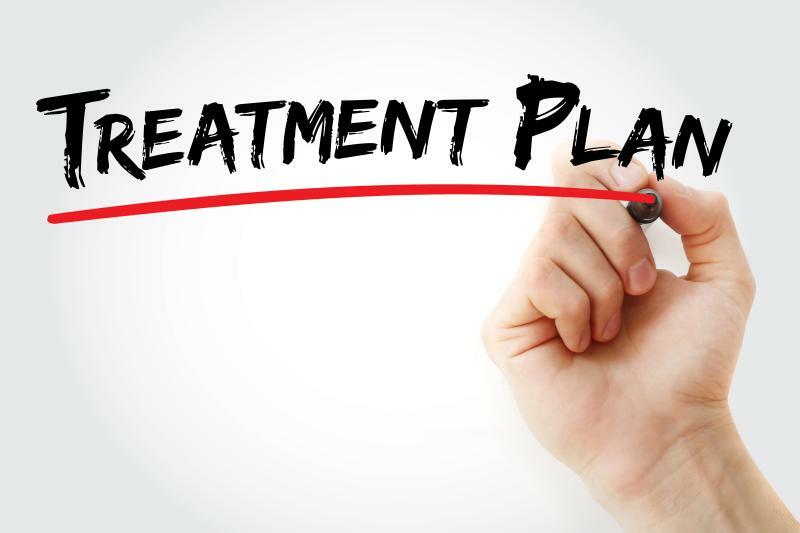 Therapy should be adjusted if there is no improvement by a maximum of 3 months after the start of treatment or if the target has not been reached by 6 months. 5) In patients with a contraindication to MTX or early intolerance, leflunomide or sulfasalazine should be considered as part of the (first) treatment strategy. 6) Short-term glucocorticoids should be considered when initiating or changing conventional synthetic DMARDs (csDMARDs), in different dose regimens and routes of administration, but should be tapered as rapidly as clinically feasible. 9) bDMARDs and tsDMARDs should be combined with a csDMARD. In patients who cannot use csDMARDs as comedication, IL-6 pathway inhibitors and tsDMARDs may have some advantages compared with other bDMARDs. 11) If a patient is in persistent remission after having tapered glucocorticoids, tapering of bDMARDs could be considered, especially if this treatment is combined with a csDMARD. 12) If a patient is in persistent remission, tapering the csDMARD could be considered. Our patient was diagnosed with early RA as supported by more than 6 weeks’ history of bilateral symmetrical wrist arthritis, raised inflammatory markers, and high titres of RF and anti-CCP. He was first started on MTX and short-course steroid as initial treatment. Unfortunately, MTX had led to deranged liver function and was thus discontinued. (Figure 2) Even if he could tolerate MTX, he failed to achieve improvement at 3–6 months when he first attended our clinic, which warranted further adjustment of medications. 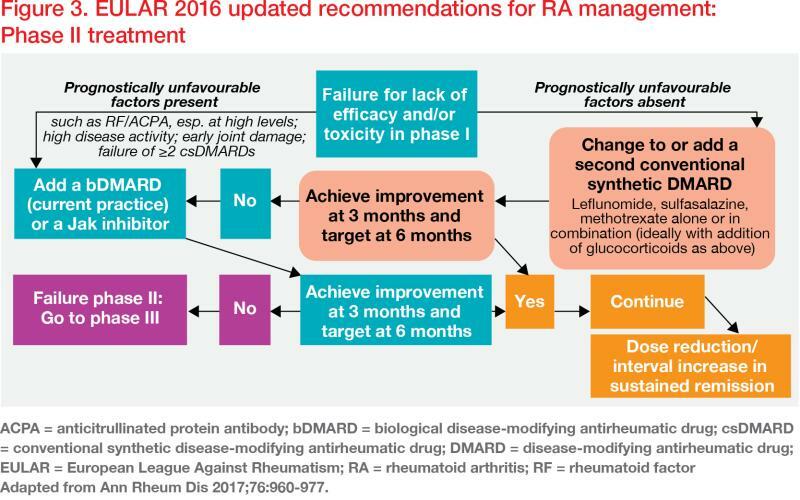 Early diagnosis of RA has enabled efficient treatment initiation and prevention of early joint damages and disabilities. csDMARDs such as MTX remain the first drug of choice if there are no contraindications. In the presence of poor prognostic factors, early switching to or addition of biologics plays a key role in achieving low disease activity or disease remission. 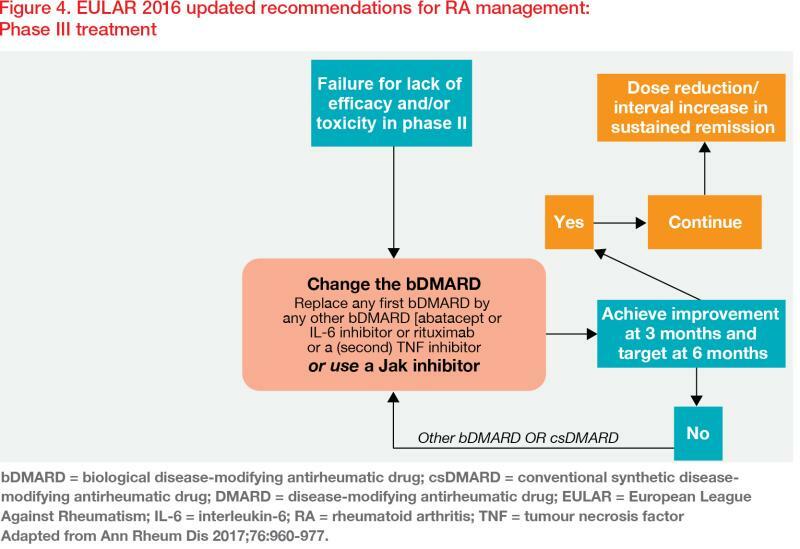 The new RA treatment recommendation stratifies the use of conventional and new biologics according to risks, with a hierarchy of therapeutic approach and treatment phases. 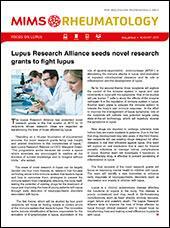 The emergence of biologics has broadened treatment options for patients with RA.